You can grab the latest from my blog. Along with changes that work with the bB1.1 beta builds there are other enhancements like a title screen wizard, integration with bblint, and a new bookmarking feature. These builds are specific to the beta versions of bB1.1 so use at your own risk. It should work fine (even better?) with the latest 1.0 release of bB. 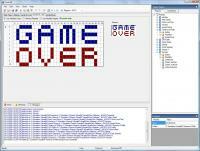 If you're having trouble using the sprite/playfield editor go here for a registry fix. Special thanks to Random Terrain for beta testing and submitting bug reports for many, many years! Holy crap, that looks awesome. I'll definitely have to give it a try. I haven't tried it yet, but I couldn't wait to say Thank You! 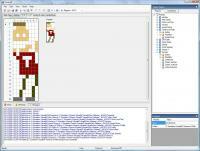 This is much, much appreciated and it will contribute greatly to bB game creation. 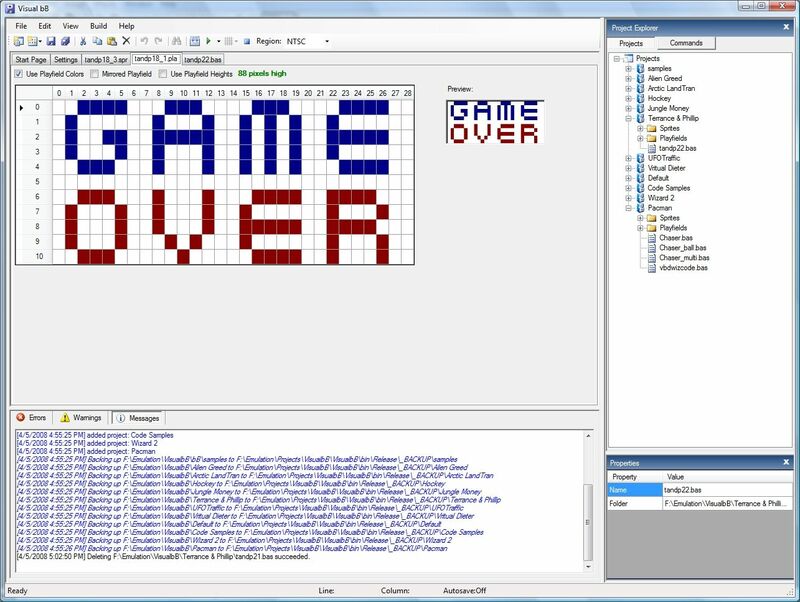 Everyone who develops a game using this IDE owes you one, big time. Why did you make it? Will you be releasing any bB games? 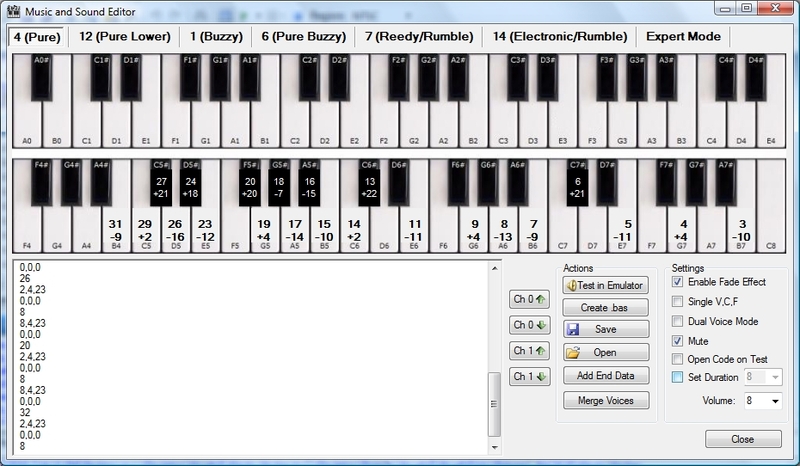 I always wanted to learn bB, but couldn't find an editor that would make it easy enough to do it quickly. 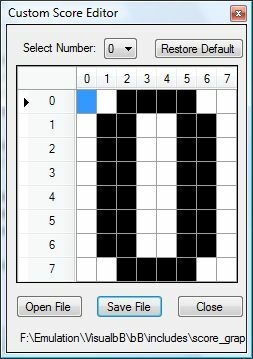 The more I thought about it, the more I became obsessed with making a great bB editor. I've made some test projects, but nothing really worth sharing, mostly stuff to make sure I could get this working. I'm hoping you more creative types can use it to create better games for me to play. Thanks for your effort - I'll have to try this out later. I usually use a Mac but have a PC as well. That said, do you have any plans to release the source (privately would be OK) as I wonder if it will build under Mono? VbB isn't just for programmers. 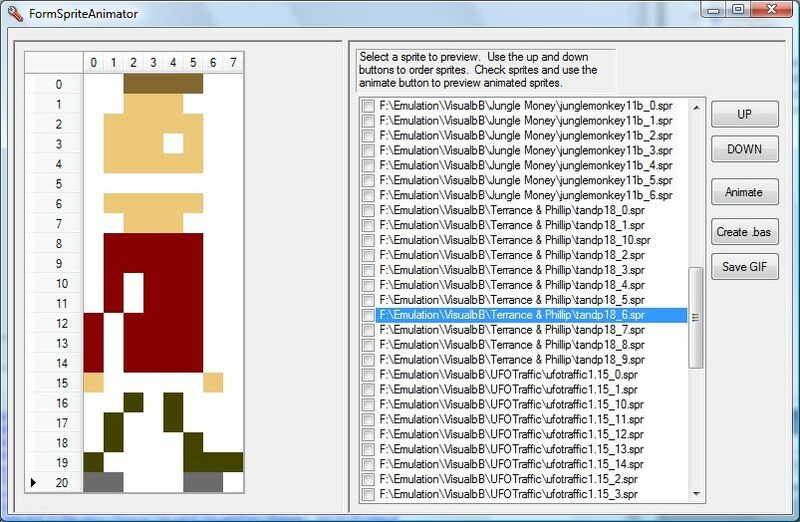 Your artist friends can use the VbB sprite editor to make some cool color sprites, then they can save the sprites and send them to you. All you'll have to do is plop them into your game. 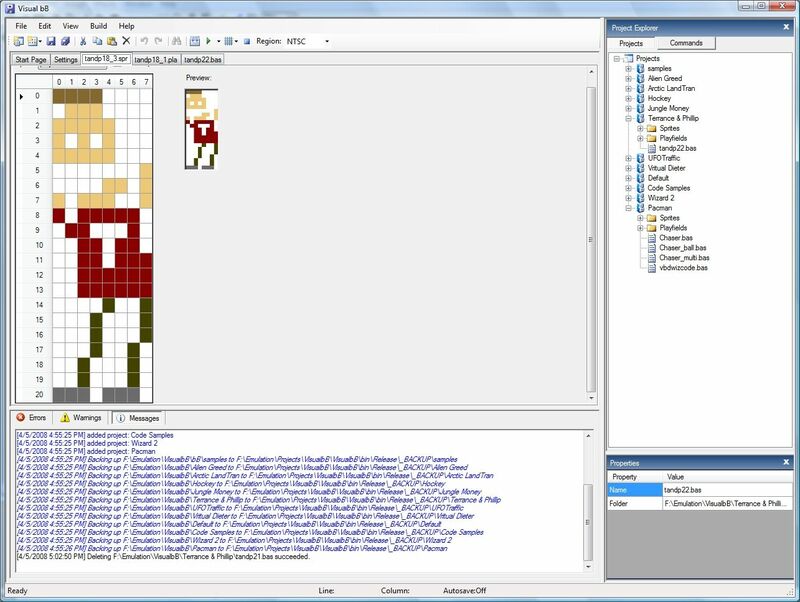 No more spending hours trying to recreate sprites by looking at GIFs. 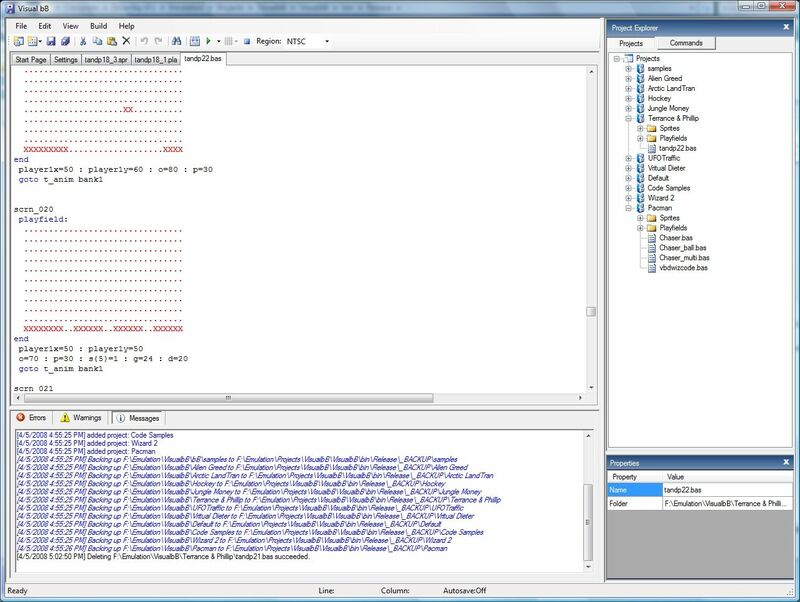 The same can be done with playfields using the VbB playfield editor. Once programmers and artists start using VbB, a lot of time and energy will be saved. I will try this on my old PC but I hope there will be a possible Mac conversion available in the future. Here is a project that I have been working on for some time and it's finally in a shareable state. 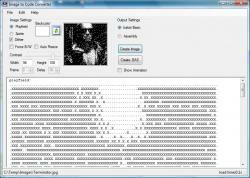 Visual bB is an integrated development environment for writing Atari 2600 programs in batari Basic. I still have PPC-based Macs, so that's not an option for me. In a few years, the issue will probably be moot, however. Stupid question, but in settings, what do I put for Commands and Dictionary, or do I leave those blank? From what I remember, you leave those blank unless you have saved your own edited versions. Say that jwierer decided to take a 20 year trip to Mars. You can add more commands and more entries in the dictionary as batari Basic changes, so VbB will never get stale and out-of-date. Not stupid at all. Those features aren't that intuitive to use. The Dictionary is for custom terms you want to show up with color codes in the code editor. Click the dictionary button to see the current list of terms, edit as you choose and then save. It will create an XML file with your settings. Commands are useful if you want to extend the list of commands which you can access from the project explorer pane on the right side. Those commands can literally be anything such as snippets of code that you reuse. You can right click from the commands pane to generate the basic commands.xml file. From there all changes will be saved to that file and reapplied every time you load Visual bB. You can always leave them blank and use the defaults. They are only necessary if you want to make modifications. What are your favorite games created with bB so far? 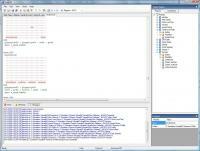 What would you most like to see developed using this IDE? Any suggestions on how the language could be improved? I wish there was an official spiral bound bB manual. I don't have a printer and I'm sick of reading it on my screen. It looks like this will really help shorten the "staring at the same s^&*" aspects of using this language for me. I hope you will be able to release an update for use with 1.1 as well. 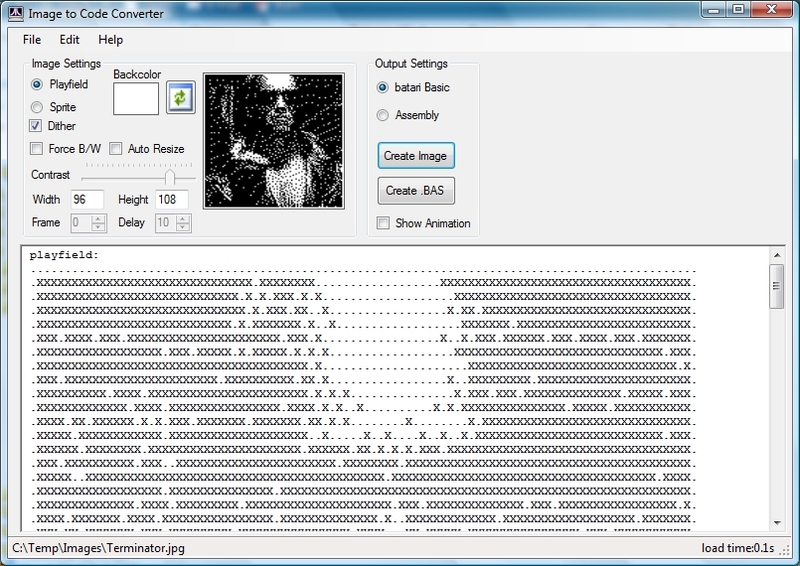 Edited by MausGames, Sun Apr 6, 2008 1:25 AM. I wish there was an official spiral bound bB manual. I don't have a printer and I'm sick of reading it on my screen. Once the AtariAge Wiki is set up, many people will be able to work on the bB info and it will become even easier to understand. Then maybe someone will put it in book form. Now that we have a new IDE that is easy-to-use, has cool tools, and won't become obsolete overnight, maybe more people will finally use bB and a book will be worth the cost. A company like Chris++ uses that logs a worldwide ISBN number might be worth looking into. i'm about to download this. hopefully this will help me see a lifelong dream come true; my name on a cart. uhh ok it's asking me for the link to the bB compiler. which of the four EXEs is that? and then "Commands"? and for "Dictionary"? wtf??? thank you. i should have read every post. sorry. Sorry, ain't spending $280 to use a bB IDE. You can drop that down to $200 by using Boot Camp, but that's still a lot of money. Implementation of .NET Framework 3.0 is under development under an experimental Mono subproject called Olive, but the availability of a Mono framework supporting .NET 3.0 is still not planned yet. Thanks! I'm wanting to work with bB again. Will use this.